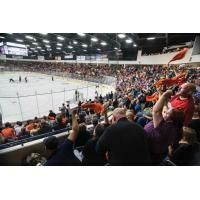 Flint, Mich. - The Firebirds will play their final home game of the 2018-19 season Saturday when they host the Sarnia Sting in front of an expected capacity crowd in Flint. Puck drop for the fourth-annual 'Fan Appreciation Night' is set for 7 p.m. (EDT) at the Dort Federal Credit Union Event Center. Flint has won three of their last four games and are 4-1-1-0 through their past six games, earning nine out of a possible 12 points in that time. The Firebirds have also won three of their last four games on home-ice in Flint. Saturday night's tilt marks the seventh of eight meetings between these clubs this season and the final of four in Flint. All-time, Flint is 15-14-1-0 against Sarnia and is 9-5-1-0 on home-ice in Flint vs. the Sting. This year, the Firebirds are 2-3-1-0 against Sarnia and are 2-0-1-0 on home-ice, picking up points in all three home games. The teams will meet again Sunday afternoon in Sarnia at 2 p.m. to conclude the OHL regular season. The last time these two teams met was Jan. 12, when the Firebirds posted a 6 - 2 victory over the Sting in Flint. Ty Dellandrea (Dallas Stars) recorded a five-point night, scoring once and contributed assists on four other goals. Jake Durham recorded a four-point night, scoring his second hat-trick of the campaign against Sarnia and adding a helper. Eric Uba also had his fourth three-point game of his young career, assisting on three of the Firebirds' markers. It's the Firebirds' annual 'Fan Appreciation Night' and post-game player autograph session. Also, Hockey Hall of Famer Willie O'Ree, who is credited with being the first black player to play in the NHL will be in attendance Saturday night (Watch Video). O'Ree's 22-year pro career included two seasons with the Boston Bruins. He played two games in 1957-58 and 43 in 1960-61, earning a total of four goals, four assists and 26 penalty minutes. He had five 30-goal seasons in the minors and was elected to the Hockey Hall of Fame in 2018 as a builder of the sport. For the fourth consecutive year, the Firebirds want to say thank you for another great season of Firebirds' Hockey. There will be many free giveaways on tap including the Firebirds team picture to the first 2,500 fans through the doors, compliments of Commercial Graphics. Fans can stay after the game to meet-and-greet the Firebirds' players during a post-game autograph session in the lobby. Additionally, fans will have the opportunity to take home Dort Federal Credit Union thundersticks and foam pucks, 277 Firebirds' players 'Big Heads' compliments of Landaal Packaging Systems, 1,000 lanyards compliments of PFCU, fan appreciation scratch-offs and many more giveaways! Presented by Great Lakes Sandwich Co & Cafe, Saturday evening's dinner menu for the Blue Line Club features pulled pork sliders, cheesy-chicken philly sliders, baked beans, macaroni and cheese, Mexican corn, potato salad or garden salad and assorted desserts. Saturday's menu is available to all sponsors and season ticket holders for $12 per person. Dinner RSVPs are encouraged by emailing Karla Turner at karla@flintfirebirds.com.